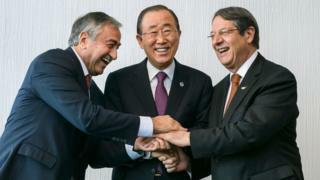 The leaders of Cyprus are holding UN-mediated talks in Switzerland aimed at reuniting their divided island. UN Secretary-General Ban Ki-moon is at the Mont Pelerin resort for the talks. He hopes to broker a deal before he steps down at the end of the year. A previous UN peace plan for Cyprus was rejected by Greek Cypriots in 2004. Cyprus President Nicos Anastasiades will discuss tough security and territorial issues with Turkish Cypriot leader Mustafa Akinci over five days. Reports say this round of talks - one of many over the past 42 years of frozen conflict - will focus on possible land transfers, to address the claims of Cypriots who fled their homes in 1974. As he opened the talks on Monday, Ban Ki-moon said the two leaders had reached a critical moment, adding that "the prospect of a solution in Cyprus is within their reach". Cyprus has been split since Turkish troops invaded in 1974, following an Athens-inspired coup by Greek Cypriots seeking union with Greece. Since then the island has been cut in two, with the northern third controlled by Turkish Cypriots and the southern two-thirds by Greek Cypriots. UN troops patrol the Green Line - a buffer zone cutting across the island, where damaged buildings are a reminder of the 1974 inter-communal fighting. Governance: Broad agreement that the new state should be based on a federal model; but how loose should that federation be? 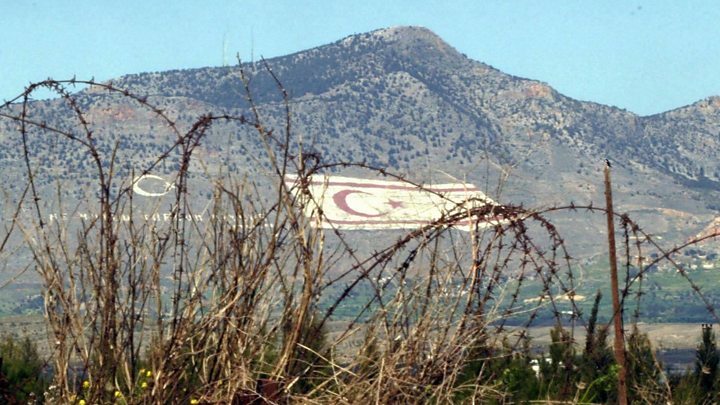 Cyprus joined the EU in 2004, but EU law does not extend to the Turkish-controlled north. The self-styled Turkish Republic of Northern Cyprus is recognised only by Turkey. Cyprus adopted the euro as its currency in 2008, yet the north uses the Turkish lira. EU diplomats are involved in the reunification talks. A deal would be a great relief for the EU after so many years of Cyprus stalemate, and at a time of inter-ethnic conflict in the nearby Middle East. A deal would remove a major obstacle in Turkey's bid to join the EU, though many other serious obstacles remain. UK Brexit: Could Cyprus inspire pro-EU Scotland?